Purpose: This study aimed to compare the efficacy and safety of generic and branded irbesartan for 8 weeks in patients with mild-to-moderate essential hypertension. Patients and methods: We screened 221 patients with mild-to-moderate hypertension. 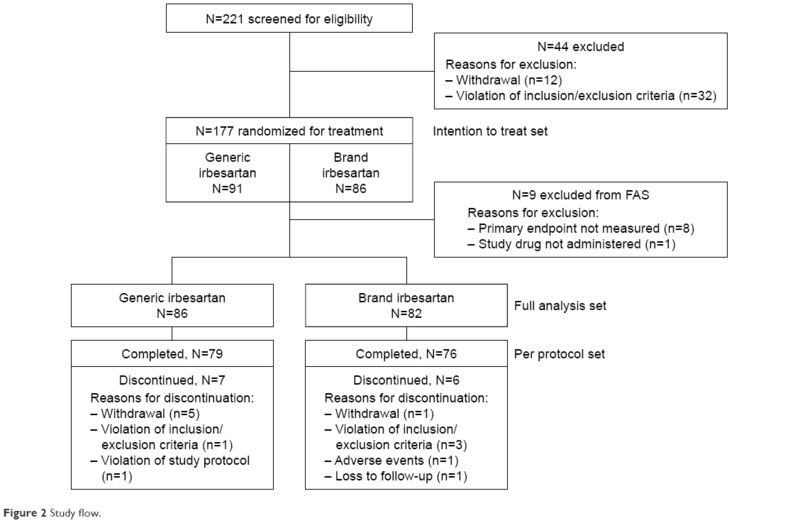 After exclusion per study criteria, 177 subjects were randomized to receive 150 mg generic irbesartan (n=91) or branded irbesartan (n=86) as the intention to treat set. The primary efficacy endpoint of this study was the change in mean sitting diastolic blood pressure (SiDBP) from baseline to 8 weeks between the generic and branded irbesartan groups. 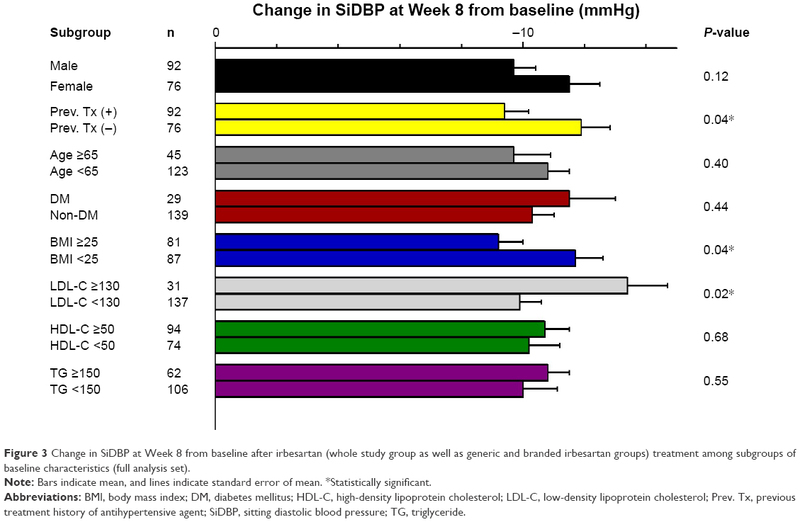 The secondary efficacy endpoints were the change in mean SiDBP at Week 4 from baseline and the change in mean sitting systolic blood pressure (SiSBP) at Weeks 4 and 8 from baseline in both groups. All safety issues were evaluated. Results: At Week 8, the generic and branded irbesartan groups showed significantly reduced SiDBP (−10.3±8.0, −10.7±7.7 mmHg, all P<0.0001) compared with baseline values, and the mean between-group difference in SiDBP change after 8 weeks of treatment was −0.4±1.2 mmHg, showing the non-inferiority of generic irbesartan vs branded irbesartan. Furthermore, secondary efficacy, which was the mean change of SiDBP from baseline at 4 weeks, was comparable between the two groups (−9.4±8.1 vs −9.9±7.4 mmHg, P=0.69). There were no between-group differences in mean changes of SiSBP after 4 or 8 weeks of treatment (P=0.78, P=0.97, respectively), or in the incidence of adverse effects (16.7 vs 24.4%, P=0.20). Conclusion: Generic irbesartan treatment in patients with mild-to-moderate essential hypertension has shown effective antihypertensive effects comparable with the branded irbesartan treatment, with similar incidence of adverse effects. After the patent on the original irbesartan expired, generic irbesartan was developed on the basis of the pharmacokinetic results of bioequivalence tests that proved bioequivalence in the field of area under the plasma concentration time curve (AUC) and maximum plasma drug concentration (Cmax). The objective of this Phase IV study was to compare the antihypertensive efficacy and safety of generic and branded irbesartan in order to prove the effectiveness of generic irbesartan in patients with mild-to-moderate essential hypertension. Male and female Korean subjects aged 20–75 years with mild-to-moderate essential hypertension were enrolled if they were newly diagnosed with hypertension, if they had not received treatment for hypertension within 2 weeks of study entry, or if they agreed to or could withdraw from their current hypertensive therapy for the 2-week washout period. Mild-to-moderate hypertension was defined as a mean sitting diastolic blood pressure (SiDBP) reading of 90–109 mmHg, calculated by averaging two measurements taken 2 minutes apart. In addition, patients with diabetes or renal insufficiency (serum creatinine 1.5 to <2.5 mg/dL) with mean sitting systolic blood pressure (SiSBP) more than 130 mmHg and mean SiDBP more than 80 mmHg at study entry were allowed to enroll in this study. All patients provided voluntary written informed consent to participate in this study. Patients were excluded from the study if they met any of the following exclusion criteria: 1) severe hypertension (defined as mean SiDBP ≥110 mmHg and/or mean SiSBP ≥180 mmHg at the screening and randomization visits); 2) a change in SiDBP ≥10 mmHg or a change in SiSBP ≥20 mmHg measured in both arms at the screening and baseline visits; 3) any secondary hypertension such as coarctation of the aorta, aldosteronism, renal artery stenosis, Cushing’s syndrome, pheochromocytoma, polycystic kidney disease, adrenomedullary hyperfunction, and hyperadrenocorticism; 4) uncontrolled diabetes before the screening visit (HbA1C ≥9%); 5) malignant hypertension; 6) symptomatic orthostatic hypotension; 7) history of congestive heart failure (NYHA class III or IV), unstable angina, myocardial infarction, peripheral artery disease, or receiving percutaneous coronary intervention or coronary artery bypass graft within 6 months of screening; 8) clinically significant ventricular tachycardia, ventricular fibrillation, or ventricular flutter; 9) history of stroke, cerebral infarction, or cerebral hemorrhage within 6 months of screening; 10) subjects needing other antihypertensive drugs such as ACE inhibitors, calcium channel antagonists, β-blockers, α-blockers, ARBs, or vasodilators; 11) or subjects needing to be treated with any drugs that could affect the BP. This study was a randomized, open-label, multicenter, Phase IV clinical trial to compare the antihypertensive efficacy and safety of generic irbesartan (Aprtan®) and branded irbesartan (Aprovel®) in patients with mild-to-moderate essential hypertension. In addition, this study aimed to determine whether the antihypertensive effect of generic irbesartan is non-inferior to that of branded irbesartan. The study was approved by the institutional review board of each participating center (Table S1). Figure 1 summarizes the study design. Random assignments were made by a randomization table using the statistical program, SAS version 9.2 (SAS Institute Inc., Cary, NC, USA). After voluntary consent to participate in the study, subjects went through both a screening and a washout period. Subjects who met the eligibility criteria were randomized into the study group (150 mg generic irbesartan), and control group (150 mg branded irbesartan) at a 1:1 ratio, and the treatments were orally administered for 8 weeks. Subjects were asked to visit the study center at Weeks 4 and 8 after treatment initiation for efficacy and safety assessments. A calibrated mercury sphygmomanometer was used to measure the subjects’ BP, and BP was measured at least twice in both arms; the arm that recorded higher SiDBP was selected as the reference arm. If both arms showed the same SiDBP, the arm with the higher SiSBP was selected. Subsequently, the selected arm was used to measure BP at each visit before any other procedure. The primary endpoint of this study was the change in mean SiDBP at Week 8 from baseline in the generic and branded irbesartan groups. 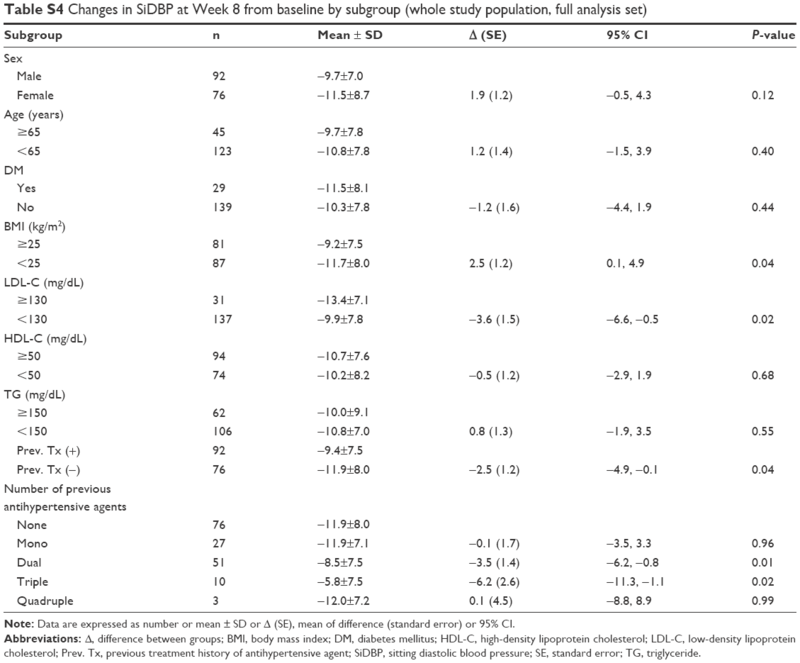 The secondary endpoints were the change in mean SiDBP at Week 4 from baseline in both groups, the change in mean SiSBP at Weeks 4 and 8 from baseline in both groups, the normalization rate of BP (defined as the proportion of responders with SiDBP <90 mmHg and SiSBP <140 mmHg) at Week 8 from baseline in both groups, and the response rate of BP (defined as the proportion of subjects whose SiDBP decreased >10 mmHg and SiSBP decreased >20 mmHg) at Week 8 from baseline in both groups. In addition, subgroup analysis was conducted to compare the change in SiDBP at Week 8 from baseline in the generic and branded irbesartan groups, and to compare the effect of irbesartan treatment (combined generic and branded irbesartan groups) according to the baseline characteristics of the study patients. For tolerability evaluation, the subjects’ drug compliance was confirmed by using the prescriptions and the drugs returned by the subject. Drug compliance was defined as the number of tablets absent in a study period divided by the number of tablets the subject was planned to take in the same period. The drugs remaining after administration were returned to the pharmacy, and their quantities were recorded. Safety-profile endpoints were treatment-related adverse events (TRAEs), defined as any untoward events not present before administration of the study drug or events already present that worsened in intensity or frequency during treatment. TRAEs included abnormalities found on clinical laboratory testing, vital signs, physical examination, and/or electrocardiography (ECG) readings. Regardless of the causal relationship with the study drug, clinical symptoms, onset dates, stop dates, severities, whether such adverse events (AEs) caused drug discontinuation, and the causal relationships with the study drug were recorded. All clinically significant abnormal laboratory test results (including hematology/blood biochemistry tests, urine tests, and ECG) were collected as AEs. Moreover, AEs were classified as adverse event, adverse drug reaction, and serious adverse event. In addition, the intensity of AEs was classified as mild, moderate, and severe. AE terms were coded using coding World Health Organization Adverse Reaction Terminology (WHOART) 092. All efficacy analyses were conducted by a full analysis set (FAS) analysis. For the primary efficacy analysis, a one-sided 97.5% lower limit of difference rate and two-sided 95% CI of difference between the two groups was computed. The non-inferiority margin was set as 4 mmHg, as in a previous similar study.3,4 The number of subjects was determined to assume a one-sided significance level of 0.025 and a 90% statistical power. The calculation indicated that 72 subjects were required for each group. Considering an average dropout rate of 20%, the total number of subjects was determined to be 90 for each group. Demographic and baseline characteristics were summarized descriptively for all participating patient subjects. After testing data for normality, continuous variables were expressed as the mean ± SD/standard error (SE) or median (range: 25%–75%). The last-observation-carried-forward was used to impute missing values in the intent-to-treat data set. For intergroup differences, the Student’s t-test or Mann–Whitney U test was used to evaluate the statistical significances of continuous data, and a chi-squared test or Fisher’s exact test was used appropriately for categorical data. Change from baseline to Weeks 4 and 8 in mean SiDBP and mean SiSBP were analyzed by using the paired t-test for intragroup comparison, and Wilcoxon’s rank sum test was used for intergroup comparison. The normalization rate and response rate of BP at Week 8 were analyzed by using the chi-squared test to compare between the treatment groups. The Student’s t-test or Mann–Whitney U test was used to test the difference of change in SiDBP at Week 8 after irbesartan treatment (whole study group as well as the generic and branded irbesartan groups) from baseline between subgroups created by baseline characteristics of the study patients. The difference of change in SiDBP at Week 8 from baseline between the generic and branded irbesartan groups in the subgroups of baseline characteristics was tested by the Student’s t-test or Mann–Whitney U test. All safety analyses were conducted by a safety-set analysis. For AEs, the number of patients who experienced one or more adverse drug reactions was recorded. Data are presented as percentages and two-sided 95% CIs. Intergroup comparisons were conducted using a chi-squared or Fisher’s exact test. Values of P<0.05 were considered statistically significant. All statistical analyses were conducted by using SAS version 9.2 (SAS Institute Inc., Cary, NC, USA). A total of 221 subjects were screened in nine hospitals. Of these, 44 subjects (19.91%) were excluded for not meeting inclusion or exclusion criteria (32 subjects) and withdrawal of consent (12 subjects). Consequently, 177 subjects in the intention-to-treat set were randomized to treatment, where 91 subjects were placed in the generic irbesartan 150-mg group and 86 subjects in the branded irbesartan 150-mg group. Of the 177 randomized subjects, one subject was excluded from the safety set due to non-administration of investigational product and eight subjects were excluded from the FAS due to non-measurement of the primary endpoint. Finally, 13 subjects were excluded from the per protocol set due to violation for inclusion/exclusion criteria (four subjects), withdrawal of consent (six subjects), loss of follow-up (one subject), AEs (one subject in the branded irbesartan group), and violation of study protocol (one subject). Therefore, data of a total of 155 subjects (79 subjects in the generic irbesartan group and 76 in the branded irbesartan group) were analyzed as the per protocol set. Figure 2 shows the flow of study subjects. Table 1 summarizes the baseline characteristics of the study population. On the intention-to-treat analysis, there were no significant differences in baseline characteristics between the two groups including BP, cardiovascular risk factors, drugs treatment, and laboratory findings. The history of treatment with antihypertensive agents did not differ significantly between generic irbesartan and branded irbesartan groups; 44.6% of all study subjects were naïve for antihypertensive agents and 37.9% of study subjects received multiple antihypertensive agents at the initial screening periods (Table 1). In addition, there were no significant differences in baseline characteristics and previous treatment history of antihypertensive agents between the two groups in the FAS analysis (Table S2). Note: Data are expressed as number ± SD or number (percentage). Abbreviations: ACE, angiotensin-converting enzyme; ALT, alanine aminotransferase; ARB, angiotensin type II receptor blocker; AST, aspartate aminotransferase; BMI, body mass index; HDL-C, high-density lipoprotein cholesterol; HTN, hypertension; LDL-C, low-density lipoprotein cholesterol; SiDBP, sitting diastolic blood pressure; SiSBP, sitting systolic blood pressure; TG, triglyceride. Analysis of the primary endpoint revealed that, after 8 weeks of treatment, the mean SiDBP had decreased by 10.3±8.0 mmHg in the generic irbesartan group and by 10.7±7.7 mmHg in the branded irbesartan group relative to baseline SiDBP, indicating the significant antihypertensive efficacy of both groups (P<0.0001, respectively). By FAS analysis, the mean difference between the generic and branded irbesartan groups of the changes of SiDBP after 8 weeks of treatment was −0.4±1.2 mmHg, and the one-sided 97.5% lower limit was −2.8 mmHg, which meets the −4 mmHg margin of non-inferiority. 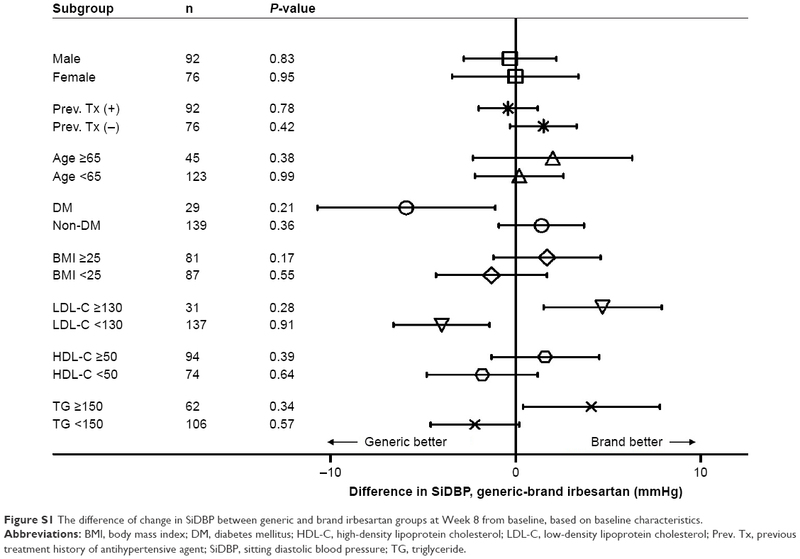 Therefore, generic irbesartan was shown to be non-inferior in SiDBP reduction compared to branded irbesartan (Table 2). Note: Data expressed as mean ± SD or (95% two-sided CI), unless specified otherwise. Abbreviations: SiDBP, sitting diastolic blood pressure; SiSBP, sitting systolic blood pressure. The difference of change in SiDBP at Week 8 from baseline between the generic and branded irbesartan groups was not statistically significant in all subgroups (all P<0.05; Figure S1). Generic and branded irbesartan, in 4 weeks of treatment, significantly reduced mean SiDBP compared with those of the baseline SiDBP (−9.4±8.1 and −9.9±7.4 mmHg, each P<0.0001). In addition, the mean changes of SiDBP after 4 weeks of treatments compared to those of the baseline SiDBP between the two groups did not differ significantly (P=0.69; Table 2). The mean SiSBP at 4 weeks of treatment in the generic and branded irbesartan groups significantly reduced, as compared with the baseline SiSBP (−14.9±12.9 and −14.3±14.6 mmHg, each P<0.0001) and that at 8 weeks (−16.5±12.4 and −16.6±14.2 mmHg, each P<0.0001). The mean changes of SiSBP after 4 or 8 weeks of treatment between the two groups did not differ significantly (P=0.78 and P=0.97, respectively). In addition, percentage changes in SiDBP and SiSBP at Week 8 between the generic and branded irbesartan groups did not differ significantly. The SiDBP and SiSBP after 8 weeks treatment were normalized in 58 subjects (67.4%) in the generic irbesartan group and 62 subjects (75.6%) in the branded irbesartan group, and the normalization rate of BP at Week 8, from baseline, did not differ significantly between the two groups (P=0.24). The response rate of BP at Week 8 from baseline was not significantly different between the two groups (generic irbesartan group 46.5% vs branded irbesartan group 36.6%, P=0.19). On the safety-set analysis, the mean drug-exposure period did not differ significantly between the two groups (generic irbesartan group 52.7±12.8 days vs brand irbesartan group 53.7±11.6 days, P=0.66). In addition, the mean number of drug administrations during the drug-exposure period did not differ significantly between the two groups (generic irbesartan group 50.2±13.0 days vs branded irbesartan group 51.5±11.2 days, P=0.76). Drug compliance did not differ significantly between the two groups (generic irbesartan group 95.47%±8.6% vs branded irbesartan group 96.0%±7.3%, P=0.63). All safety analyses were conducted by the safety-set analysis. Table 3 and Table S3 reveal the AEs in both groups. The incidence of AEs did not differ significantly between the two groups (generic irbesartan group 16.7% vs branded irbesartan group 24.4%, P=0.20). 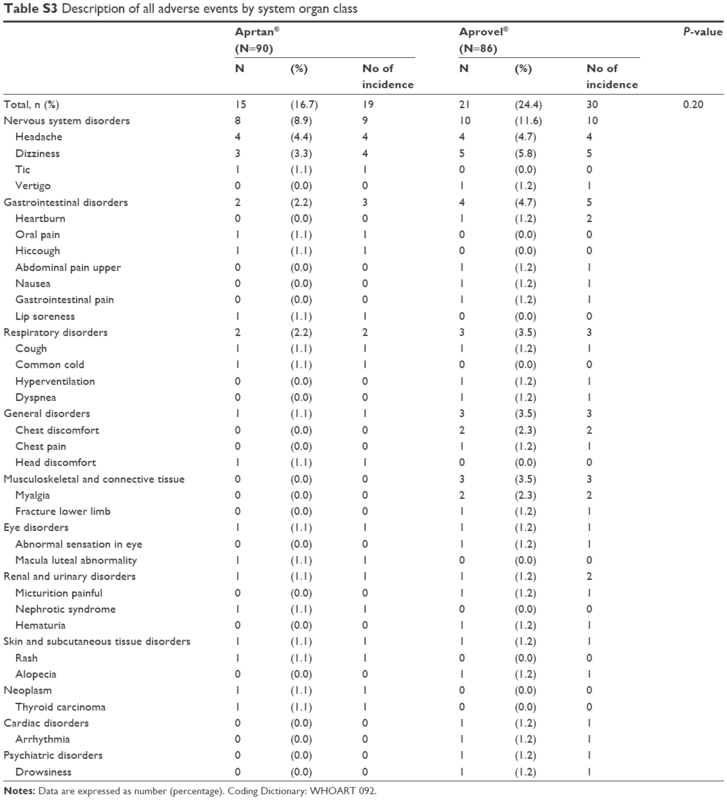 Furthermore, the incidence of AEs related to study drugs did not differ significantly between the two groups (P=0.44; Table 3). Moreover, the frequency of serious AEs was not different between the two groups (generic irbesartan group 1.1% vs branded irbesartan group, 0%, P=1.00). In addition, one serious AE (macula luteal abnormality) was reported in the generic irbesartan group; however, it was not severe and was classified by the investigators as a serious AE not related to the study drug. Furthermore, the severity of all AEs was not statistically different between the two groups. Two patients in the branded irbesartan group withdrew from the study due to adverse events (dizziness and headache, respectively), which was suspected to be related to the study drug. Note: Data are expressed as number (percentage) or (95% CI), unless specified otherwise. Abbreviations: ADR, adverse drug reaction; AE, adverse event; SAE, severe adverse event. The change in SiDBP at Week 8 from baseline after irbesartan (whole study group as well as generic and branded irbesartan groups) treatment among subgroups of baseline characteristics (FAS) was evaluated. Irbesartan treatment reduced SiDBP at Week 8 from baseline in female patients more than in male patients, but the difference was not statistically significant (P=0.12). Of interest, subjects in the study subgroup with body mass index (BMI) less than 25 kg/m2 showed significant SiDBP reduction from baseline as compared with subjects with BMI more than 25 kg/m2; moreover, subjects with LDL-C 130 mg/dL or more showed significant SiDBP reduction from baseline than subjects with LDL-C less than 130 mg/dL (P=0.04 and P=0.02, respectively). Of further interest, the response of SiDBP at Week 8 from baseline after irbesartan treatment was greater in antihypertensive-naïve subjects than in subjects with a previous history of antihypertensive treatment (P=0.04; Figure 3 and Table S4). In addition, the response of SiDBP at Week 8 from baseline after irbesartan treatment in antihypertensive-naïve subjects was similar to that of the mono-antihypertensive agent group and greater than in those in the dual- and triple-antihypertensive treatment groups (Table S4). Other subgroups of baseline characteristics did not differ with regard to the response of SiDBP at Week 8 from baseline after irbesartan treatment. Figure 3 Change in SiDBP at Week 8 from baseline after irbesartan (whole study group as well as generic and branded irbesartan groups) treatment among subgroups of baseline characteristics (full analysis set). Note: Bars indicate mean, and lines indicate standard error of mean. *Statistically significant. Abbreviations: BMI, body mass index; DM, diabetes mellitus; HDL-C, high-density lipoprotein cholesterol; LDL-C, low-density lipoprotein cholesterol; Prev. Tx, previous treatment history of antihypertensive agent; SiDBP, sitting diastolic blood pressure; TG, triglyceride. Our study demonstrated that generic irbesartan treatment in mild-to-moderate essential Korean hypertensive patients has shown effective antihypertensive effects that are comparable with branded irbesartan treatment in terms of similar reduction of SiDBP and SiSBP at 4 and 8 weeks, with similar incidences of adverse effects. Generic irbesartan (Aprtan®) has proven bioequivalence in the field of AUC and Cmax, and is approved by the Korean Food and Drug Administration (FDA) and prescribed in real-world clinical practice. As a result of the bioequivalence test, the 90% CIs using logarithmically transformed data were within the acceptance range of log 0.8 to log 1.25 (log 0.93 to log 1.06 and log 0.94 to log 1.12 for AUC and Cmax, respectively). In our current Phase IV clinical trial, the BP-reduction effects of generic irbesartan treatment met non-inferiority criteria. With regard to the safety profile, generic irbesartan treatment was well tolerated and showed similar incidence of AEs as compared to branded irbesartan treatment, and the frequency of serious AEs was very rare and did not differ between the two groups. Therefore, our study demonstrated that generic irbesartan is an effective antihypertensive agent in patients with mild-to-moderate essential hypertension without safety concerns. Based on these characteristics, the prevalence of antihypertensive medication use among hypertensive adults in the US showed that the use of ARBs increased 100% from 2001 to 2010.9 Irbesartan acts selectively and competitively as a representative drug of ARBs and has widespread use worldwide. The generic irbesartan developed by Dong-A ST in Korea has shown bioequivalence with branded irbesartan. In our current study, generic irbesartan treatment for 8 weeks showed 10.3 mmHg reduction of mean SiDBP, which was comparable with that of branded irbesartan treatment in patients with mild-to-moderate essential hypertension. In addition, the reductions of SiDBP and SiSBP between the two groups were similar throughout the study period. The SiDBP and SiSBP reduction of the generic irbesartan group at 8 weeks in our current study were −10.3±8.0/−16.5±12.4 mmHg, which are comparable with those of previous reports (7–13/10–23 mmHg).10,11 The response rate of the generic irbesartan group was 46.5%, which is similar to that in previous reports (34%–72%).10 Generic irbesartan treatment showed effective BP reduction in various subgroups by baseline characteristics, and the BP reduction with generic irbesartan treatment was comparable with that of branded irbesartan treatment in patients with various subgroups by baseline characteristics. In our current study, irbesartan treatment has shown less effective BP reduction in patients with BMI of 25 kg/m2 or higher. Several studies have indicated that patients with obesity and hypertension require more antihypertensive medications; nevertheless, their BP was less well controlled when compared with normal-weight patients with hypertension.12,13 Irbesartan treatment has shown effective BP reduction in patients with LDL-C 130 mg/dL or greater. The previous study demonstrated that LDL-C induces expression of the AT1 receptor.14 Therefore, irbesartan treatment in patients with high LDL-C may reduce mainly BP via blockade of the AT1 receptors. Among all study subjects, 54.8% of all study subjects were on antihypertensive treatments before the initial screening points. Of interest, the extent of BP reduction of irbesartan in patients with a history of antihypertensive agents was small, especially among subjects who took dual- and triple-antihypertensive therapy, when compared to antihypertensive-naïve subjects. This result may suggest that subjects with more severe hypertension who require a greater number of antihypertensive agents need intensive antihypertensive treatment. As the sample size of this subgroup analysis was small, larger-scale studies should be conducted to validate our results. Previous studies have reported that the incidence of adverse drug experiences in patients receiving irbesartan monotherapy was 20%, with 6% of patients discontinuing because of AEs.15 In our current study, 16.7% of AEs occurred in the generic irbesartan group, and the rates of AEs in the generic irbesartan group was similar to that of the branded irbesartan group, at 24.4%. In addition, only 2.2% of drug-related AEs in the generic irbesartan group occurred, as compared to 4.7% in the branded irbesartan group, and the frequency of serious AEs was very rare, which was also not different between the two groups. Our study has several potential limitations. First, this study is an open-label study, which might have influenced the study results. Because generic irbesartan (Aprtan®) was already approved by the Korean FDA based on a bioequivalence study and widely prescribed in routine clinical practice and given that this study was not a Phase III, but a Phase IV, study, we selected an open-label study design and believe that the trial design may not have affected the study results. Second, the use of SiDBP as the main enrollment criterion, which excludes patients with isolated systolic hypertension, might limit the applicability of the study results. However, the Clinical Trial Guidance for Antihypertensive Agents by the Korean FDA suggests using SiDBP as the main eligibility criterion. Third, we only evaluated BP and AEs; therefore, further evaluations of the efficacy of generic irbesartan on target-organ damage and clinical outcomes are warranted in the future. Fourth, 37.9% of study subjects had a treatment history of multiple antihypertensive agents; although subjects with antihypertensive treatments on initial screening underwent a 2-week washout period, this may have influenced the results of our study. In conclusion, generic irbesartan treatment in patients with mild-to-moderate essential hypertension has shown effective antihypertensive effects that are comparable with that of branded irbesartan treatment with a similar incidence of adverse effects. This study was financially supported by Dong-A ST Co. Ltd (Seoul, Korea). The study was initiated by Dong-A ST and was designed, conducted, interpreted, and written by the authors under the supervision of Dr HS Kim. An external monitoring group, DreamCIS Inc. (contract research organization [CRO], Seoul, Korea), was involved in the collection and analysis of data. Matchar DB, Mccrory DC, Orlando LA, et al. Systematic review: comparative effectiveness of angiotensin-converting enzyme inhibitors and angiotensin II receptor blockers for treating essential hypertension. Ann Intern Med. 2008;148(1):16–29. Waeber B. A review of irbesartan in antihypertensive therapy: comparison with other antihypertensive agents. Current Therapeutic Research. 2001;62(7):505–523. Park S, Chung N, Kwon J, et al. Results of a multicenter, 8-week, parallel-group, randomized, double-blind, double-dummy, Phase III clinical trial to evaluate the efficacy and tolerability of amlodipine maleate versus amlodipine besylate in Korean patients with mild to moderate hypertension. Clin Ther. 2005;27(4):441–450. Kim MS, Jeong MH, Lee MG, et al. The Phase 4 Randomized, Public, Parallel, Comparative, Clinical Trial to Compare Efficacy and Safety of S-(−)-Amlodipine Nicotinate with Ramipril in Hypertensive Patients. J Korean Soc Hypertens. 2011;17(3):103–113. James PA, Oparil S, Carter BL. Evidence-based guideline for the management of high blood pressure in adults: report from the panel members appointed to the Eighth Joint National Committee (JNC 8). JAMAa. 2014;2014(311):507–520. Staessen JA, Fagard R, Thijs L, et al. Randomised double-blind comparison of placebo and active treatment for older patients with isolated systolic hypertension. Lancet. 1997;350(9080):757–764. Beckett NS, Peters R, Fletcher AE, et al. Treatment of hypertension in patients 80 years of age or older. N Engl J Med. 2008;358(18):1887–1898. Group SCR. Prevention of stroke by antihypertensive drug treatment in older persons with isolated systolic hypertension. Final results of the Systolic Hypertension in the Elderly Program (SHEP). SHEP Cooperative Research Group. JAMA. 1991;265(24):3255–3264. Croom KF, Plosker GL, Irbesartan PGL. Irbesartan: a review of its use in hypertension and diabetic nephropathy. Drugs. 2008;68(11):1543–1569. Bays H, Park J, Reilly K, Triscari J. Irbesartan safety and effectiveness: a post-marketing surveillance study. Am J Hypertens. 1999;12(4):120. Bramlage P, Pittrow D, Wittchen HU, et al. Hypertension in overweight and obese primary care patients is highly prevalent and poorly controlled. Am J Hypertens. 2004;17(10):904–910. Cushman WC, Ford CE, Cutler JA, et al. 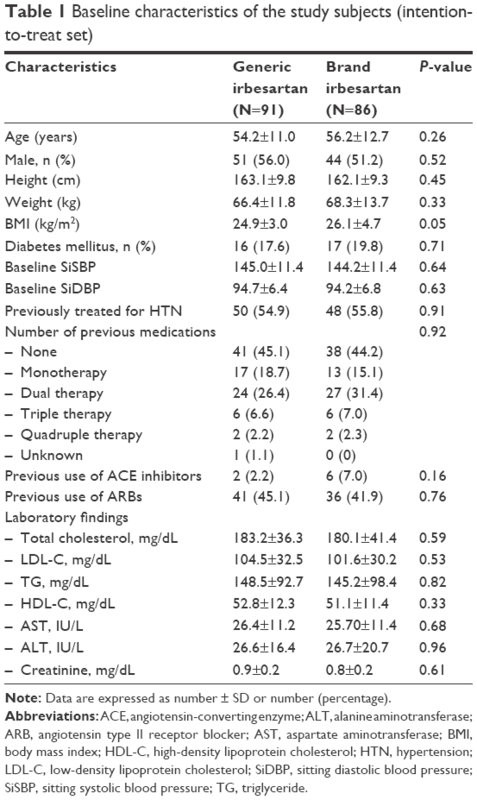 Success and predictors of blood pressure control in diverse North American settings: the antihypertensive and lipid-lowering treatment to prevent heart attack trial (ALLHAT). J Clin Hypertens. 2002;4(6):393–404. Han SH, Quon MJ, Kim JA, Koh KK, Adiponectin KKK. Adiponectin and cardiovascular disease: response to therapeutic interventions. J Am Coll Cardiol. 2007;49(5):531–539. 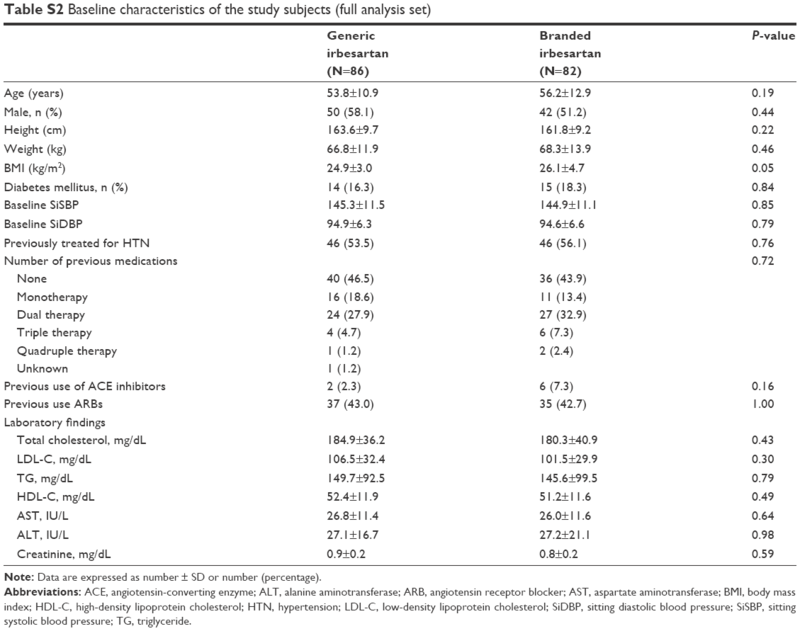 Littlejohn T, Saini R, Kassler-Taub K, Chrysant SG, Marbury T. Long-term safety and antihypertensive efficacy of irbesartan: pooled results of five open-label studies. Clin Exp Hypertens. 1999;21(8):1273–1295. Abbreviations: ACE, angiotensin-converting enzyme; ALT, alanine aminotransferase; ARB, angiotensin receptor blocker; AST, aspartate aminotransferase; BMI, body mass index; HDL-C, high-density lipoprotein cholesterol; HTN, hypertension; LDL-C, low-density lipoprotein cholesterol; SiDBP, sitting diastolic blood pressure; SiSBP, sitting systolic blood pressure; TG, triglyceride. Figure S1 The difference of change in SiDBP between generic and brand irbesartan groups at Week 8 from baseline, based on baseline characteristics. Notes: Data are expressed as number (percentage). Coding Dictionary: WHOART 092. Note: Data are expressed as number or mean ± SD or Δ (SE), mean of difference (standard error) or 95% CI. Abbreviations: Δ, difference between groups; BMI, body mass index; DM, diabetes mellitus; HDL-C, high-density lipoprotein cholesterol; LDL-C, low-density lipoprotein cholesterol; Prev. Tx, previous treatment history of antihypertensive agent; SiDBP, sitting diastolic blood pressure; SE, standard error; TG, triglyceride.